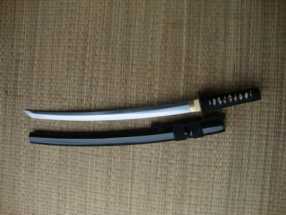 This is the matching Wakizashi for the Katana Model 2, the Samurai companion sword with a 6" handle and 21" blade. Otherwise, the fittings are exactly the same as the Ronin Model 2 - same iron tsuba, same iron fuchi/kashira, silk ito, real rayskin and a powerful, no nonsense through tempered hand made 1060 carbon steel blade. 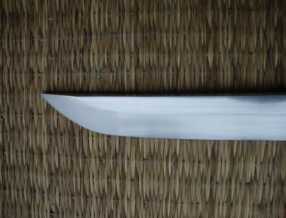 Thick, expertly tempered, hand forged and sharpened Monotempered 1060 carbon steel blade. 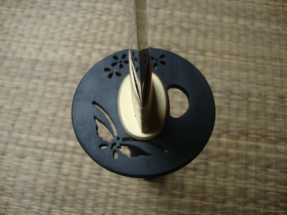 All IRON Tsuba, Fuchi and Kashira. Genuine Silk Ito Wrap, Real Rayskin and Brass Menuki handle ornament. Single pegged mekugi. Hand cut and polished buffalo horn Kurikata, Koguchi and Kojiri on Saya with high quality synthetic sageo. 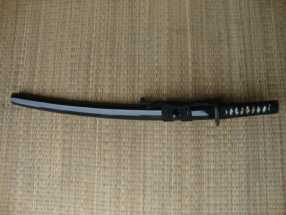 Good saya black with black bone, nice tight tsuba, fittings and wrap, very nice flawless blade. Sharp and nicely polished. 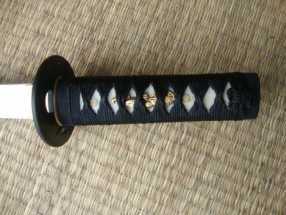 I have several Ronin katana and am very pleased with their quality and craftsmanship. This little one zipped though two mats without any difficulty whatsoever, another nice Ronin.